Team Jefferson Starship reviewed this attraction on October 1, 2016. Deceased Farm is huge and winding self-guided attraction beckoning you for an evening of scares and entertainment. It is filled with a huge number of effects and lots of cast members that are ready to personalize the experience. Every year, DF keeps growing and adding little twists and turns to keep you guessing. Your path through the farm will lead you from the disorientation of a 3D house and then in and out of buildings, scenes, and the surrounding corn field as you venture to make your escape. Staff and cast are clearly differentiated at DF; the cast are in-character and there to provide scares. From the up-close and in-your-face cannibals in the Junkyard and Red Riding Hood’s banter to the creepy marionette and kids playing on a bus in the distance, the haunt cast of DF are good at what they do. Deceased Farm is a “light-touch haunt;” touching was not over-done and was never uncomfortable. Some areas seemingly had nothing but screaming. However, overall, the cast was very interactive. The corn field trail was even staffed with jump scares, chainsaws, and distant howling to foreshadow the appearance of the Big Bad Wolf – as if Little Red’s presence didn’t give it away already. The scare crew at the Deceased Farm rely more on makeup than masks and, for the most part, the makeup is done to good effect. The makeup in the Junkyard scene, for example, was very well done on one actor; at least he appeared well-done (he did mention something about a stove, dinner, and an escape). Most of the costumes were detailed and fit in well. Little Red Riding Hood was immediately recognizable, despite the damage done to her face – what big eyes she didn’t have! The actors that were scattered throughout the graveyard and the interior rooms of the house (there are really multiple structures you enter and leave, not just one house) were typically in costumes with lots of small touches and details. There is minimal street signage pointing you to the Deceased Farm; but, once you are on site, it is easy to find your way around. Staff are friendly and welcoming. There aren’t really any monsters working the queue line; however, in the large waiting yard, there are places for photo opportunities, a zombie shoot ($5 extra), concessions and a beer garden! There’s plenty of rock and metal music occasionally interspersed with Halloween favorites that are sure to get the blood pumping and get you in the mood. Inside the haunt, there are a few places where you are going to have to get down low. If you’ve got someone big in your group – even just an average-sized adult – they’re probably going to have to bend over pretty far or get down on their hands and knees to crawl. Be forewarned and bring clothes you can get dirty! Outside of the Haunt at Deceased Farm, there is a definite carnival- or fair-like atmosphere, but all of it is heavily influenced by Halloween. The beer garden has several haunt-, fall- and farm-themed names for various brews and our Team Member (who tried three different ones) found them to be “good, good, and veeeeerrrrrry good.” The farm yard is a fun place to hang out and talk, either before or after you go through the haunt itself. Some scenes at Deceased Farm were very loud – loud to the point of distracting us from the rest of the experience. If you can’t hear a haunter saying creepy things to you, you’re less likely to be scared. The 3D house, which used to be a separate attraction, has been integrated into the main haunt very well… giving you time to get disoriented before the first actor looms out at you from the background. The artwork inside the 3D portion of the haunt is done very well. The animatronics are well-timed, and there are even some custom-built effects on DISPLAY that are well done. We enjoyed the laser-light room as well. There were some areas that we wanted more lighting in… if for nothing else than to look at the detail on display from the static props and wall décor. There is not a single theme used across the Haunt. There are different areas that are tied together with a theme, but these are not separated or delineated from one another into separate haunts. As a result, there are carnivals, graveyards, junkyards, a broken down bus, spooky deserted houses, strange electronic rooms, and more… all tied together by a creepy cast of spooks, ghouls, wolves, dolls, cannibals, and freaks that are ready to bring you into their own little worlds. 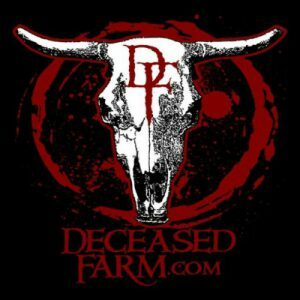 There are lots of different scare effects going on at Deceased Farm – everything from distractions, jump scares and small spaces to big 3D portraits, walking through a corn field, being chased by monsters and trapped in a junkyard with crazy cannibals. Sometimes, the haunters seemed to focus on the front of our group, which was partly an effect of narrow passages or walls of corn. Be sure to stick your jumpiest friend in the front for the best result! We’d like to see the cornfield turned into an actual maze with some dead-ends and loops, but we’re not sure how much of the field they’re allowed to cut down for the haunt. One member of our crew remembers a time when the cornfield was more maze-like. But, as stated, Deceased Farm changes up a number of things every year to keep the scares fresh. Deceased Farm is a self-guided walk-through; but, moving steadily forward, we were in and out in 35 minutes. Tickets are $20 per person, $35 for fast pass. If you get there late, you may definitely want this, as lines at DF can grow sizably later in the evening. Still, $20 for 35 minutes of fun comes out to 1.75 minutes of entertainment per dollar spent. They make great use of their given space to pack in as much as they can, so you should pack up your car and head over to the Deceased Farm when you get the chance.